BizInt Smart Charts for Patents can build charts from search results from the LexisNexis TotalPatent service. 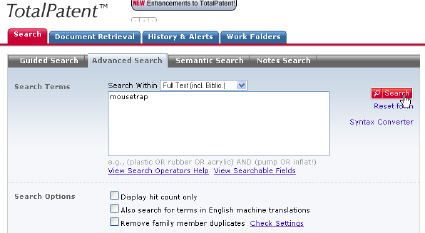 TotalPatent is supported by BizInt Smart Charts for Patents 3.3.22 (July 12, 2010) or later. Images are not currently exported. "Online Learning" video showing how to use BizInt Smart Charts with TotalPatent. Run your search in Total Patent. 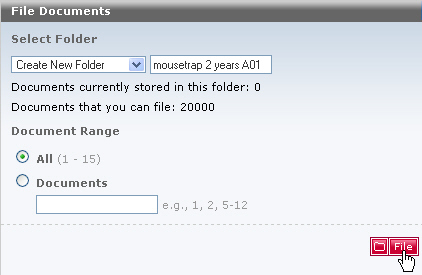 File your search results in an online Work Folder by selecting the folder icon. Create a New Folder and file your results. When you see the "Complete..." message, click OK to continue. Select the Work Folders tab and then the Download icon. 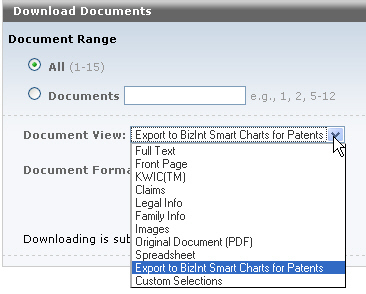 On the Document View drop-down list, select the "Export to BizInt Smart Charts for Patents" option. "BPD" (BizInt Patent Data) will automatically appear as the Document Format. When you see this panel, you can click on the link to save the .bpd file or open it automatically in BizInt Smart Charts for Patents.